This page contains OSCE notes in various radiological images pertaining to rhinology. 2. Describe the lesion seen. 3. What could be the lesion ? 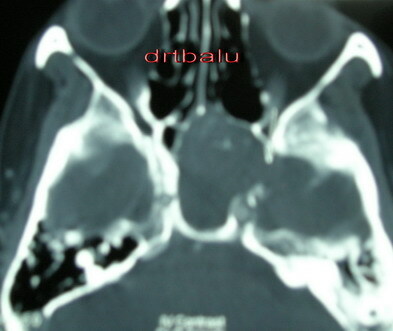 This is a CT scan of paranasal sinuses plain coronal view. 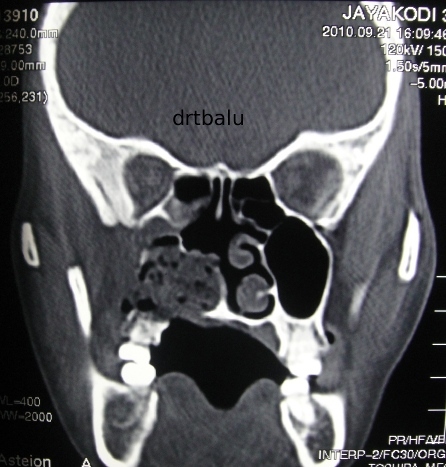 It shows an expanding soft tissue lesion involving the right nose, right maxillary sinus. involved. The mass has breached into the orbit. The skull base area appears free. Possible diagnosis : Malignant tumor right nose and maxilla involving the orbit. Name any 4 risk factors for sinonasal cancers. Name 4 ocular features of sinonasal malignancy. 3. Whitish mass seen inside the right nasal cavity - gritty on touch. shadow occupying the floor of the right nasal cavity. Comment on the CT scan. 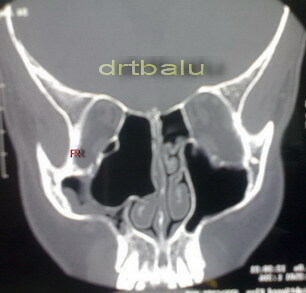 This is a coronal CT scan plain of paranasal sinuses. drains into the concha. Bulla is seen in the medial wall of the orbit. 10 years old child came with c/o nasal block both sides since birth. Dryness of mouth since birth. Foul smelling nasal discharge both sides. What is the view ? 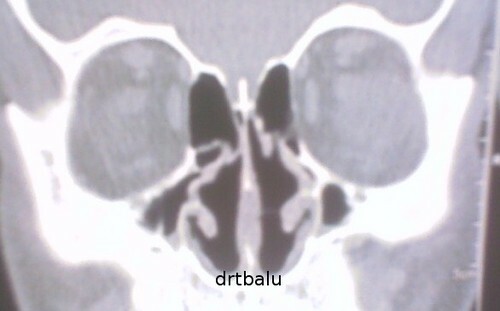 Contrast CT of paranasal sinuses axial cut. Contrast material is instilled into both nasal cavities. Shows that the contrast material does not flow into the nasopharynx. The choana is closed by bony plates on both sides. Patient came with c/o double vision and swelling over right eye - 1 day duration. What test you perform to rule out inferior rectus entrapment ? 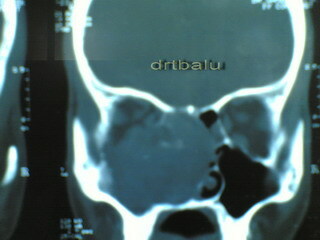 CT scan shows blow out fracture of right orbit. 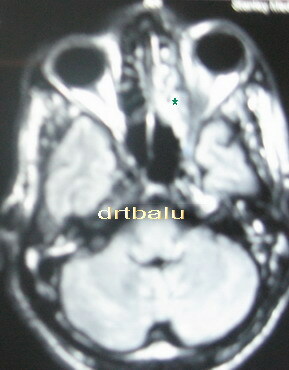 Axial MRI showing mass involving the nose, involving the optic nerve. The mass appears bright in T2 weighted image. 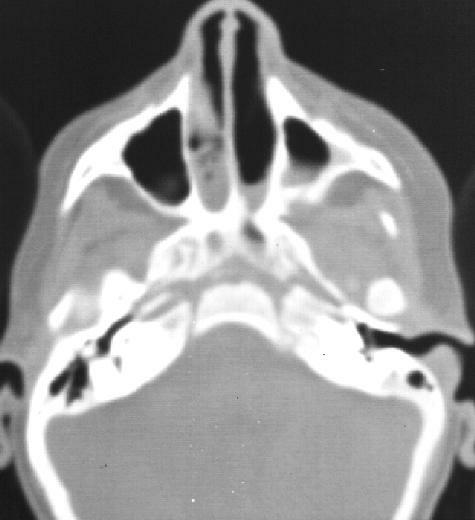 Axial CT image showing heterodense lesion filling the left nasal cavity. Left lamina papyracea appears breached. This is CT scan plain coronal view. 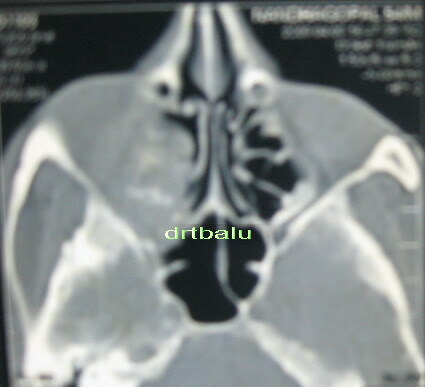 Heterodense mass seen occupying the left maxillary sinus eroding the medial wall of maxilla and protruding into the nasal cavity. Lamina papyracea appears breached. Mass could be seen entering the orbit. This is a CT scan of a 50 years old male patient who presented with blindness of right eye of 3 days duration. He also gave history of head ace - 1 month duration. He was a known diabetic on treatment for 10 years. 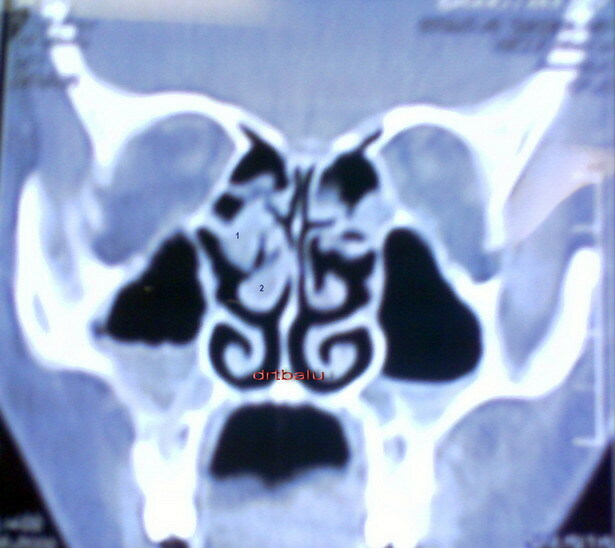 This is an axial scan showing enlarged sphenoid sinus on the right side. 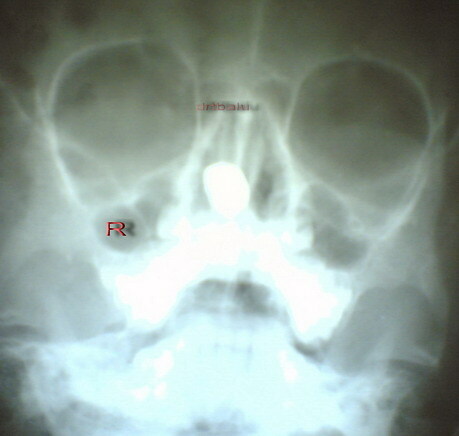 The right sphenoid sinus appears hazy and heterodense and the enlarged sphenoid sinus abuts the optic nerve on the right side. 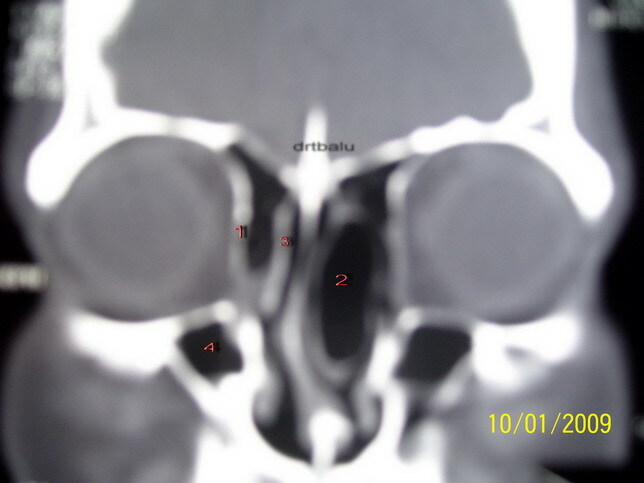 Probable diagnosis Sphenoidal sinusitis right side. Probably fungal in nature. Comment on this CT especially pertaining to 1 and 2. 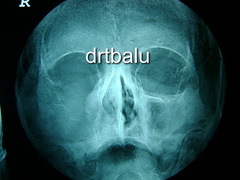 You are seeing a coronal ct scan picture of the patient. Coronal ct shows defect in the cribriform fossa on the left side. The patient is having csf rhinorrhoea. Prophylactic antibiotic therapy and closure of csf leak is the ideal managment modality. Anterior rhinoscopy showed reddish friable mass occupying the right inferior meatus. 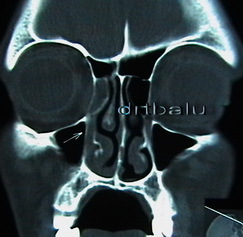 This is a coronal CT scan of nose and paranasal sinuses (anterior cut). Soft tissue shadow could be seen medial to the medial wall of right orbit. extending along the nasolacrimal duct up to the inferior meatus. Comment on the xray paranasal sinuses water's view. Can you comment on the status of pterygopalatine fossa from this xray? This is a digital plain x-ray paranasal sinuses water's view. It shows an expansile lesion involving right maxilla. Lateral wall of maxilla is found to be eroded. The floor of the orbit (R) is also eroded with extension of mass into right orbit. Probable diagnosis could be Malignant growth right maxilla. may not have been involved. 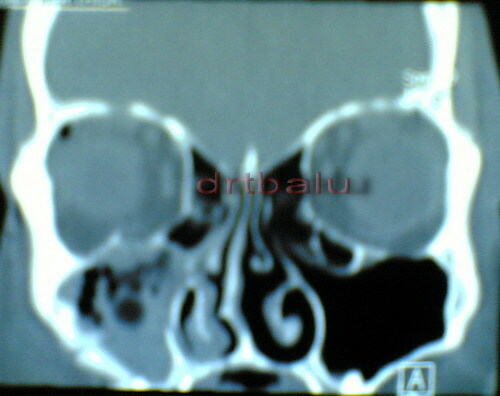 This is an image of Coronal CT plain of paranasal sinus. Posterior cut is demonstrated. on the right side is eroded. 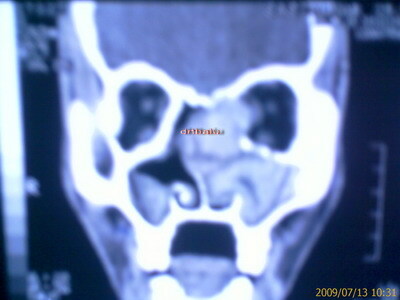 This is a coronal CT scan plain of Nose and paranasal sinuses. It shows thinned nasal mucosal lining. The turbinates appear to be atrophic. The nasal cavities appear to be excessively roomy on both sides.